U.S. Navy veteran Jared Lyon G’13 heeded the call of “Join the Navy and See the World” as a high school graduate in 2001. “That promise did not disappoint,” Lyon says. 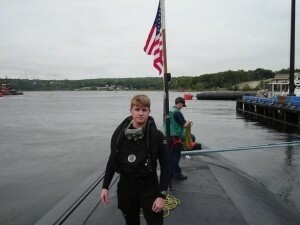 A submariner and Navy diver, Lyon was stationed in Groton, Conn., but his deployments took him all over the world—Japan, Guam, India, the Suez Canal, Greece, and the Middle East, among many other areas. 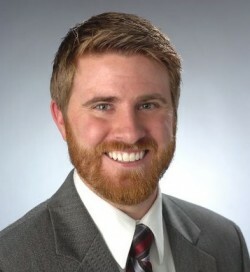 A veteran of the Global War on Terrorism, Lyon now works with fellow veterans as the national program manager for the Entrepreneurship Bootcamp for Veterans with Disabilities (EBV) and EBV-Families (EBV-F). EBV was founded by the Whitman School of Management in 2007 and has been administered by the Institute for Veterans and Military Families (IVMF) at SU since that organization’s inception in 2011. Q: What do you reflect on during the Veterans Day observance? A: It’s an annual reminder to take a look at, not only the way I live my life, but how other veterans do. It’s a reflection on something that I think of as “a servant’s heart.” I recognize it in myself but I see it constantly in other veterans. Service doesn’t end when you take off the uniform; it continues in our communities. Additionally Veterans Day is also a chance for me—since I separated from active duty in 2005—to reach out to all my buddies who maybe I haven’t talked to in a little while and let them know I’m thinking about them. With social media, my friends and I will change our profile pictures on Veterans Day to a photo of us from when we were in uniform. It’s a day of pride, it’s a day of remembrance and it’s a day of reflection. Q: What makes you most proud about your service with the U.S. Navy? A: A lot of the humanitarian work that we do particularly stands out as a highlight of my service. There was one particular humanitarian effort in Goa, India, at a free school run by a Christian minister. The roof had caved in and the rain had destroyed the library books, so we brought a whole bunch of books. Guys with construction experience refinished the roof and the rest of us helped put up fresh coats of paint. Then we brought bolts of cloth and a couple of foot-powered sewing machines so they could use it to make extra clothing, and we built them a playground. Just shy of 100 sailors and marines showed up and did this in one day, sharing the day with the kids and bringing the good will of the United States. Q: What is the work that you do with EBV? A: My day-to-day responsibilities are for recruitment and admissions to the EBV programs and EBV national consortium of universities, of which SU serves as the national host. EBV is offered at eight universities across the country. It’s the first initiative of its kind for veterans among major universities since World War II. It’s incredible work that I get to do every day because I work with my brothers and sisters in arms as they achieve their next mission, their next dream of business ownership and entrepreneurship. Q: What do you hope to bring to veterans through your work with IVMF and EBV? I’m a former entrepreneur, having failed at business once and then been pretty successful at a second endeavor. Once you’ve been bitten by the entrepreneurial spirit, it really stays with you. The work that I do in helping others achieve their dreams of entrepreneurship is something I hope to bring to as many veterans as possible through our program and also through the stories of our amazing graduates. We have a little over 700 graduates of our EBV program and just about 100 graduates of our EBV families program. I want to continue to bring that most American of dreams to a group of men and women who I think have earned it more than any others in owning their business. Q: What do you enjoy about being a volunteer advisor with the SU Student Veterans Club? A: I am a non-traditional student, having gotten out of the military in 2005, gone to work for two years and attending community college at night. After starting two businesses and then having a career in Major League Baseball as manager of Florida operations for the Washington Nationals, I decided to go back to college at Florida State University. As a 28-year-old student among peers who were 19 and 20 years old, I felt a sense of isolation. I came across the Collegiate Veterans Association; it was the first thing on campus that spoke to me as a non-traditional student. We created an incredible initiative to make Florida State the most veteran-friendly university in the nation, and I worked directly with the university president in writing the business plan for the initiative. I wound up being named the 2011 National Student Veteran of the Year by the Student Veterans of America. When I came to SU in January 2012, I had just finished my bachelor’s degree, so I felt an innate connection to the awesome student veterans at Syracuse. If there was anything I could do to help them as they continue to be successful on this campus, that was something I couldn’t stay away from. Also, the Student Veteran Club offers a sense of camaraderie that a lot of veterans miss when they leave the service. I love just being with veterans—if there’s anything I can do to help in their success that’s what I’ve dedicated my life to at this point.